St. Patrick's Day Schedule is Posted on our Calendar! Come see us at a venue or request a booking now! Check out what's in our Sporr​an and visit our new Store Page! 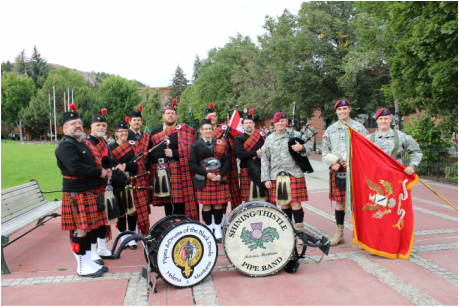 The Pipes and Drums have been invited to Italy to represent The First Special Service Force at the 75th Anniversary of the Liberation of Rome and we are seeking your support! Please consider a donation. Click on the SUPPORT button above to do so. Thank you! Taken by Kathy Bauer at the 69th First Special Service Force Reunion Parade on August 22, 2015 in Helena, MT.